Check out our groovy guide to the British Invasion, peace and love, and the rise of the decade when Baby Boomers first came of age - with a look at hippies, Woodstock, anti-war protests and the Beatles, movie stars, popular TV shows, and mod fashions. Welcome to the psychedelic 60's, man. Yeah! 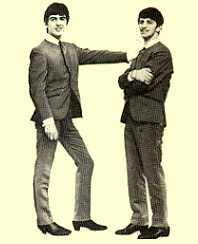 single "Love Me Do" in 1962. 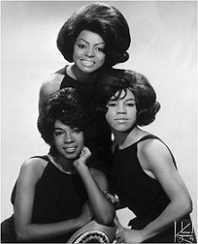 Motown's The Supremes had twelve number-one hit singles between 1964 and 1969, beginning with "Where Did Our Love Go". 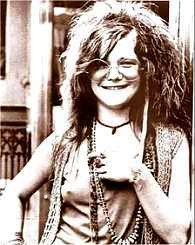 It was her overnight discovery at the Monterey Pop Festival in 1967 that helped launch the career of bluesy rock singer Janis Joplin. 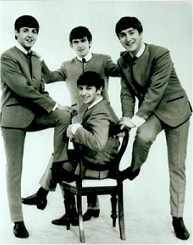 The Beatles had a huge impact on men's fashions of the 1960's including mop-top hairstyles, the nehru jacket, and "Beatle boots". For women, hemlines rose around the world when the daring miniskirt was introduced in 1964 by British fashion designer Mary Quant. 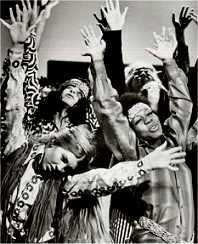 The 1960's hippie movement inspired long hair, headbands, tie-dye fabric, flower prints, love beads, and bell bottom jeans. The Psychedelic Sixties - Huge, colorful interactive exhibit on the era's music and groups, the Hippie scene, radicals, anti-war protests, Woodstock, plus a collection of posters and Rock handbills, with a special look at the events leading up to and including 1969. The Sixties - The Decade That Shaped a Generation - The full sweep from PBS, touching on politics and the civil rights movement, student protests and the Vietnam War, with interactive quizzes, fun facts & trivia, photos, related resources. BBHQ : The Sixties Section - From Baby Boomer Headquarters, where Down-with-the-Establishment extends to the navigation, but find your way to the 60's Music Room for lyrics and audio files, together with a special focus on Woodstock, oddball novelty songs, music trivia, essays, and more with membership. The 1960's Mini Fashion History - A good, illustrated overview of the mini skirt, 60's hair styles, the death of stockings, with more on the decade's high fashion in clickable thumbnail photos. The Internet Beatles Album - Listen. Do you want to know a secret? Including musical influences, trivia, myths, and insider facts about the Fab Four in featured interviews, historical artifacts, audio files and more about the benefit of Mr. Kite.